Part of the Film Preservation Blogathon co-hosted by Self Styled Siren and Ferdy on Films - a fundraiser to benefit the National Film Preservation Foundation. The NFPF will give away 4 DVD sets as thank-you gifts to blogathon donors chosen in a random drawing: two copies of Treasures III: Social Issues in American Film, 1900-1934 and two copies of Treasures IV: American Avant Garde Film, 1947-1986. Casting about for an idea for my contribution to this most excellent fundraiser, I eventually hit upon the inevitable: vampires! For it cannot be denied that vampires are a bit like movies: both look like they're alive, but they actually aren't; you see them both in the dark; and both are susceptible to spectacular and often highly destructive fires. Also, the movie BloodRayne is bad enough to make you wish that neither one of them had ever been invented. What can vampire movies teach us about film preservation? you may be wondering. Isn't film preservation about saving old newsreels and avant-garde shorts from 1912? Sure, and we need those things, too (the essential Treasures from American Film Archives DVD box sets are proof enough of that). But age, decay, and human indifference know neither genre nor art. So let's visit with three film vampires, and see what they can tell us about three different faces of film preservation. The first adaptation of Bram Stoker's definitive vampire novel Dracula was born in an act of law-breaking. When the great German Expressionist F.W. Murnau adapted the story for his 1922 Nosferatu, the production company Prana Film elected not to secure rights from Stoker's widow, Florence; instead, the film hides its obvious debt to the novel by changing character names (later adaptations would flip this around entirely: most Dracula films keep the names and abandon everything else). Florence Stoker was not fooled, and as the film enjoyed no small success in Europe, she sued Prana Film for copyright infringement. By 1925, the case had been decided in favor of the Stoker estate, and the judge ordered all copies of the film to be destroyed. Luckily for film history, by this point the movie had been distributed to enough corners of the world that it wasn't a simple matter to find every last print; luckier still, one of these copies ended up in the hands of Henri Langlois, the patron saint of film preservation if ever there was such an individual - though his print was a French-language version, lacking the detailed title cards of Murnau's original. But it is still a boon that even though most prints of Nosferatu were destroyed in short order, enough remained - many of them in heavily re-edited forms - that the film never truly dropped out of sight. Because Prana Film did not survive the lawsuit in 1925, Nosferatu has been a public domain film nearly everywhere in the world for more than 80 years now, and this means two things: the first is that there are a great many prints floating about, many of them copies of copies (of copies of copies of...). The second, which is partially a result of the first, is that a lot of versions of Nosferatu look pretty damn awful, with God knows what snips or re-ordering or added footage for whatever specific theater rented that print back in the 1920s. In 1995, a massive reconstruction and restoration of the movie was completed by the Cineteca del Comune di Bologna - restoration because it involved finding the cleanest versions of shots from three different prints (all held by the Cinèmatheque in Paris), reconstruction because the film was freshly re-tinted according to extensive scholarship, with newly-drawn intertitles which attempted as much as possible to re-create the appearance of the original German titles (which had been found in the early 1980s). The result is not exactly Nosferatu precisely as it was in 1922, but it is the closest we are ever going to come; this resoration has been the source for new distribution prints as well as a number of DVDs throughout the world; by most accounts, the Region 0 DVD put out by Kino in the U.S. in 2002 is currently best way to see it, though it lacks the German titles or the music composed for the film's original release. (For a comprehensive and absolutely fascinating article by Enno Patalas, a member of the restoration team, as well as a comparison of DVD versions, check here). 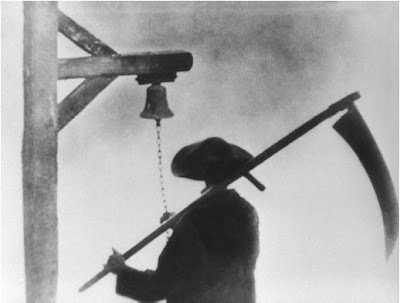 Not faring quite so well as Murnau's stunningly lucky silent is Carl Theodor Dreyer's 1932 Vampyr, a silent film turned into a sound film midway through its production. Arguably, Dreyer already used up his quota of luck; the 1981 rediscovery of The Passion of Joan of Arc is perhaps the most famous story in the annals of lost silent cinema. Directed by one of the most inventive men who ever set foot on a movie set, it's not hard to argue that Vampyr is the most beautiful and artistic mood pieces ever filmed; a waking nightmare given celluloid form. It is also a film that, until very recently, could not be seen in anything approaching an acceptable form. The first thing to note is that Vampyr was originally shot simultaneously in three versions: German, French, and English (this was common practice in the early sound era). If the English-language version was ever completed, history has swallowed it up completely, leaving us with only the German and French cuts; and they are in the most dire state. The original negatives are long since gone, and the distribution prints that remain available to us are badly scratched, incomplete, or have essentially unusable sound; often all three at once. That's to say nothing of the fact that many of the surviving prints were badly re-cut even before age and poor archiving entered the picture. At one point, the best that an English-language viewer could do to see the film was a battered print that was restored a well as could be in 1991, though nothing could be done about the Danish subtitles other than to cover them up with a black bar, and print English subtitles over that. Hardly the right way to appreciate one of the finest, moodiest horror films in existence, but better than not seeing it at all. In 2008, a reconstruction and restoration was done, and two DVDs released: by Criterion in Region 1 and by Eureka in Region 2. Both include only the German-language version (even the best French print apparently being in such appalling shape that even as a DVD extra, you couldn't possibly charge money for it), cleaned up as well as possible with what is believed to be all the missing footage restored. Now, judging the "cleanliness" of Vampyr is made a bit difficult, given the deliberately washed-out look of the 1932 cinematography, but I think it can well be said that the new DVDs, though a damn sight better than anything available before them, aren't as polished and clean as one might wish for; there are a lot of scratches and stains even now that can only be regarded as blemishes, and the soundtrack remains a bit murky. The effect of early recording techniques, no doubt, but other European films from the same period have been released and sound better. But I do not want to sound like a complainer! The current restoration of Vampyr still looks much better than we could reasonably expect, given the state of the existent film prints. There's the rub, though: barring the discovery of a long-lost print kept in a climate-controlled room somewhere, this is the best it's ever going to look: those prints are just going to keep rotting and deteriorating, and there's only so much that a future restoration can do to combat that. At some point, the French version of Vampyr will be lost outright, and the German version will likely exist only in digital form. Which is better than nothing at all, but it is, nonetheless, a distinct pity that such a noteworthy, gorgeous film has so little hope of being restored to its former glory. 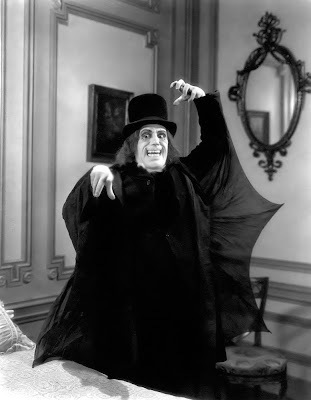 That's the mysterious, unnamed gentleman played by Lon Chaney, Sr. in Tod Browning's 1927 film London After Midnight. It's the only time in his career that chameleonoid actor ever played a vampire - okay, a fake vampire - but still, he got to dress himself up as a sharp-toothed bloodsucker for the first and last time in his estimable career of creating the greatest screen makeup in history. Why not let's take another look? 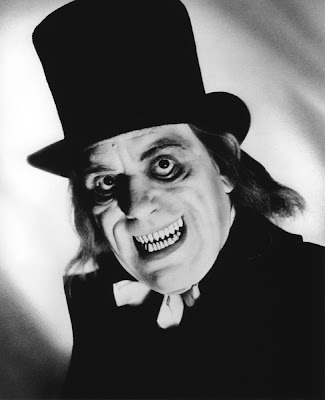 By all accounts, London After Midnight isn't all that great - virtually everyone who has seen both has declared that The Unknown is a far better Chaney/Browning effort. But, I mean, look at that make-up! That is some genuinely creepy stuff, and from 1927 at that. Doesn't part of you really want to see what a feature-length movie with that vampire is like? Well, you can't. The last known print of London After Midnight was destroyed in an electrical fire at MGM in 1967. That's the sort of thing we're up against. There came a point when there was one and only one print of London After Midnight, and it was being archived in such a way that it could be lost in an accident - a freak accident, but not an impossible accident: it's not like a meteor struck the MGM vault. (That fire, by the way, destroyed quite a few last known prints). Obviously, film preservation isn't a panacea: some films are just going to be lost, and some are going to be beyond recovery. But if there's a chance to make backup copies of a film with just that one last print, or to raise awareness of proper archiving techniques, isn't that important? The cinema is the most important cultural record of the 20th Century, and a truly unfathomable number of films of every stripe - from horror to comedy, from the silliest fairy tale to the driest documentary - are gone. Just gone. That's an ongoing process, dear reader. It can be slowed down and stopped, but not just because. It takes will. And this isn't just for us, to be able to enjoy these old movies. It's for the next generation of scholars, and the next, to be able to go back 100 or 120 years the same way we can go back 70 or 90. Digital home media help a lot, but it's not the same; the privilege of seeing an old film print is one of the most satisfying things in the world, and I don't like the thought that my children might never have that chance. I'm pretty much certain you don't either. Sorry to get preachy, folks. But it is a call to action, after all.